Lovers of the strings rejoice because the Woodstock Invitational Luthiers Showcase is back, October 26-29. 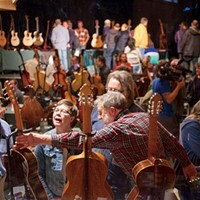 The annual acoustic guitar festival is a summit of acoustic stringed-instrument builders, players, aficionados, and collectors at locations across Woodstock, from the Bearsville Theater to the Woodstock Playhouse. The festivities kick off at Colony on October 26 with a concert featuring acoustic guitar masters Shine Delphi, Tim Farrell, Antoine Dufour, Macyn Taylor, Kinloch Nelson, and Adam Miller. Events throughout the weekend include concerts and more concerts, talks with builders, and oohing and aahing over some of the finest instruments gathered under one roof anywhere.